Borrowers beware. If you miss a payment on your car loan, don't go parking it in Ghana thinking it's safe from repossession. Turns out, the long arm of the repo man reaches all the way to Africa. That was news to Argentina, which got a shock earlier this month when authorities in the Ghanaian port of Tema seized the flagship of the Argentinean Navy -- the ARA Libertad. In what amounts to a court-sanctioned repo, the tall ship was seized as collateral pending Argentina's payment of its debts to a Cayman Islands-based hedge fund. How'd It Come to This? This story actually began more than a decade ago, when Argentina ran up some $100 billion in debt and then defaulted on the lot of it back in 2001 -- the biggest sovereign default in history. Several years of negotiations with creditors resulted in most lenders agreeing to accept 30 cents on the dollar in a new bond issuance. But "most" isn't "all," and one hedge fund, NML Capital, still wants the payment on the $1.6 billion worth in bonds it bought at fire-sale prices post-default. Now, it's taking action to get its money. NML sought and received court orders confirming its rights in both the U.K. and U.S., then applied to Ghana to enforce these judgments. 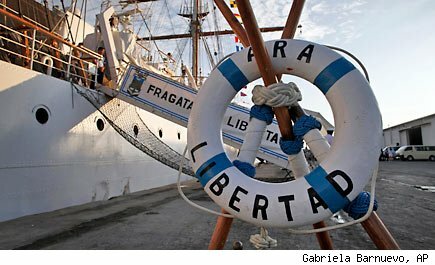 Following international law, Ghanaian authorities dutifully impounded the Libertad when it arrived in Tema on a training mission earlier this month. The ship was crewed by some 300 Argentinean sailors who are now cooling their heels in port while everyone waits to see if Argentina will pay the $20 million NML wants to release the boat. So far, Argentina's response to NML has been less than apologetic. Responding to the seizure, Argentina's foreign ministry denounced NML as a "vulture" fund and an "unscrupulous financier," and calls the repo of its boat a "stunt." Problem is, with its Navy's flagship stuck in the hoosegow, there's little Argentina can do but fume. Angered over its international embarrassment, President Cristina Kirchner is reportedly roaming the halls of Argentina's defense ministry, spitting fire and looking for heads to roll. The commander of the Argentine Navy, Admiral Carlos Alberto Paz, lost his job earlier this week. On Thursday, the head of Argentine military intelligence was similarly sent packing. One thing's for sure. You can bet their replacements will be more careful where they park their boats.